“Let the buyer beware” may be fair warning when you’re buying goods and some services; but it’s hardly a real choice for a patient entrusting an eye, brain, womb or life itself to a doctor. In short, we really have no choice but to trust our doctors. What is the nature of that trust? What are its limits? Why do we trust some doctors more than others? 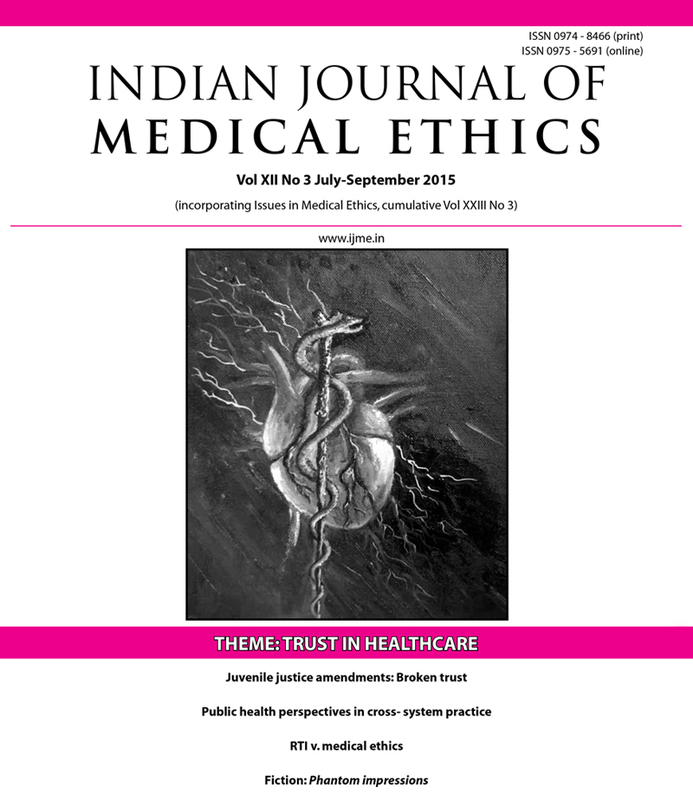 These are questions which throw up fascinating answers in the studies in our theme section on Trust in healthcare, ably guest edited by Vijayaprasad Gopichandran. Trust cannot really be confined to a section. An editorial in this issue protesting the decision to lower the age of maturity for juvenile offenders describes it as a betrayal of trust. Again, isn’t a failure to disclose risks associated with standard of care treatments to participants in a clinical trial a breach of their trust? Will this debate baring the breaking of trust lead anywhere? The job of the ethics community and an alert media is to probe and to impel debate so that people can know the facts and make informed choices. Other articles in this issue analyse the ethics of conducting home-based research on severely malnourished children; the distortions taking place in the practice of AYUSH and allopathy when policies are unclear. While we celebrate new legal rights such as the right to information, a commentary in the new section Law and Bioethics, examines how its application may infringe older rights. It’s a known fact that doctors have varied creative talents which rarely see the light. IJME has had a series of vibrant cover images donated by generous doctor friends to prove that. We now have a story by a practitioner, which, we hope will start a new segment. Aasim Ahmad, Akoijam Joy, Ali Lanewala, Alireza Bagheri, Alok Sarin, Anant Phadke, Angus Dawson, Anindita Majumdar, Anoop Thekkuveetil, Anurag Bhargava, Anwar Naqvi, Astrid Lobo Gajiwala, Bindu Desai, Bushra Shirazi, Chayanika Shah, CE Karunakaran, Chinu Srinivasan, David Thambu, Deepa Venkatachalam, Dhanwanti Nayak, Divya Bhagianadh, Ehsan Shamsi Gooshki, Faisal Khan, Fatima Castillo, Gail Andrew, Gauri Raje, Gopal Guru, GD Ravindran, George Thomas, Gracy Andrew, Ingrid Mijleteig, Irene Schipper, Jacqueline Chin Joon Lin, Jagdeesh Narayan Reddy, Jamshed Akhtar, Jayakrishnan T, Joe Varghese, Jose Dorea, K Srinivasan, Kanchana Mahadevan, Lopa Mehta, MK Mani, Murad Khan, Nandini Vallath, Navjeevan Singh, Neha Madhiwala, Nerges Mistry, Nikhil Govind, Nishant Irudayadason, Nishtha Desai, Nithya Gogtay, Padma Bhate-Deosthali, Padmaja Marathe, Padmaja Mawani, Peush Sahni, Priya Satalkar, Radha Ramaswamy, Rakhi Ghoshal, Rajan Madhok, Rajan Patil, Raman Kutty, Rana Muzaffar, Ravi Duggal, Ravindra Ghooi, Richard Cash, Rubina Naqvi, Rukmini Sen, Sabine Woehlke, Salah-Ud-Din Khan, Samiran Nundy, Sangeeta Patel, Sanjeev Lewin, Shubha Ranganathan, Sreekumar Nellickapilly,Sridevi Seetharam, Subrata Mukherjee, Sujit Chandy, Sukanya Rangamani, Sunil Shroff, Udaya Mishra, Urmila Thatte, Usha Raman, Veena Johari, Vina Vaswani, Vrinda Marwah, Waqar Kashif. Conflict of interest in public health: should there be a law to prevent it?